It has now been nine years after the 9/11 attacks and yet the day of those attacks remains stuck in the minds of many, particularly those directly affected by the attacks who lived through them in and around the New York City metropolitan area. It's been nine years since 19 al Qaeda terrorists hijacked four airliners with the intent to crash them into the World Trade Center, the Pentagon, and either the White House or Capitol building with the intent to murder more than 50,000 people and destroy the centers of commerce, national defense, and the Executive or Legislative Branch of government. The vivid memories of the attacks have faded, and have instead been replaced with controversy about the construction of Cordoba House/Park51, a community center and mosque two blocks north of Ground Zero. The local community board approved the project, which was being proposed by SoHo Properties and the Cordoba Initiative. While the local community supported the initiative, outrage spread and has sought to overturn the decision and approvals. The controversy stems over a feeling that the Islamic Center, proposed by a Sufi Muslim group, would be too close to Ground Zero for comfort and that the backers of the proposal somehow have ties to terror groups. That's despite the fact that Sufi Muslims are seen as apostates by the Salafist/Wahabis who carried out the 9/11 attacks and that SoHo Properties has said that they would not accept monies from Iran or Hamas or groups that have un-American values. Just days before the 9/11 anniversary, Imam Rauf also announced via an op-ed in the New York Times that the community center would include prayer spaces for other religious groups (an interfaith center) and a multifaith memorial to those murdered on 9/11. And while attention has been focused on the Cordoba House/Park51 controversy, a firebrand pastor has set up temporary shop at the Marriott Hotel next to Ground Zero in the hope of raising funds to build a permanent facility near Ground Zero. Bill Keller has been promoting his own brand of hate and intolerance and only recently has his conduct come under greater scrutiny. Meanwhile, there has been some progress on providing assistance to Ground Zero workers who worked on relief and recovery in the weeks and months following the attacks. Congress has yet to enact legislation to fund a program that would provide further assistance and compensation for rescue workers that have suffered all manner of ailments following the attacks (and more than a few have died). Politicians playing games has prevented the James Zadroga compensation bill from being enacted, and fault rests not only with those Republicans who voted against the bill but those Democrats in the leadership that thought that they would demand a supermajority vote to prevent Republicans from adding riders to the bill. This should have been legislation free of politics, and yet neither side could back off their innate inclination to throw politics into what should have been a nonpartisan measure. A separate compensation fund is in the works based on a settlement between those workers (including firefighters, police, and other construction workers) and the Port Authority, City of New York, and other entities and groups. The deal, which would set up a $700 million fund (less lawyer fees) got a thumbs up from the judge overseeing the case, but it has not yet been approved. The discovery for that settlement has turned up some pretty incriminating evidence that the FDNY didn't adhere to its rules regarding respirators that could have reduced exposure to toxic materials in the air throughout Ground Zero in the aftermath of the attacks. Now, it's verily impossible to take a shot framing all of the Freedom Tower from the same location as the tower is rising at a pace of 3 stories (or about 30 feet) a week. Much of the construction today would be out of frame with that shot. With the pace of steel rising, that means that the tower will reach its full height of 1,776 feet in just about a year from now. While much of the site is still below the level of the streets surrounding the 16 acres because there is more than a million square feet of space being rebuilt at or below grade level, tower cranes are erecting steel and concrete for 1WTC (the Freedom Tower), 4WTC (located on the Southeast corner) and for the transit hub that runs through the center of the site. The memorial and museum are not only underway, but the granite finishes are already applied to significant portions of both the North and South Tower footprints. Trees are already being brought into the site to begin populating the memorial groves that will surround the memorial footprints. Remnants from the 9/11 attacks are continuing to be moved and prepared for installation at the WTC Museum - including those that are too big to be installed after construction, such as the iconic tridents (more details here) and the survivors staircase. The memorial should be open in time for the 10th anniversary next year, and portions of the museum should also be open in time for the anniversary next year. That photo is courtesy of the National September 11 Memorial and Museum live camera, and was a screen capture taken August 28, 2010 (clicking on the photo will allow you to zoom in on the work. 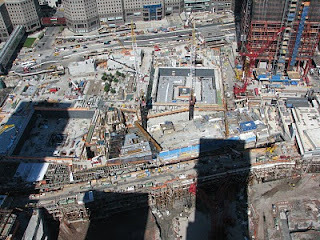 It shows the installation of the first trees for the memorial just to the left of the North Tower footprint. This view also shows the tower footprints that are nearly completely clad in granite. The structure running along the bottom third of the photo is the MTA's 1 Line, which is adjacent to the PATH terminal that is being built. The Freedom Tower (1WTC) is being built in the top right corner. Last year I lamented on the lack of progress on demolition of the former Deutsche Bank building and Fiterman Hall. Well, there's been quite a bit of progress on both fronts. Fiterman Hall has not only been demolished, but new steel is finally rising on the IM Pei designed Borough of Manhattan Community College structure. The former Deutsche Bank building is still being deconstructed, and that work may be done before the end of the year. That means that the site can then be utilized as a staging area for construction of the rest of Ground Zero and for the Vehicle Security Center than will screen vehicles entering the site once it is completed. That it took nearly nine years to demolish and begin rebuilding those two buildings is a testament to the failure of the LMDC, Port Authority, the City, State of New York in handling the demolition and reconstruction of those two structures. The glacial pace of deconstruction of the former Deutsche Bank building has meant that the resolution of the St. Nicholas Greek Orthodox Church that was obliterated by the collapsing WTC towers remains in limbo. the Port Authority and the Church have yet to complete a deal that would determine the new site for the church, the size of the church, and various other issues relating to the reconstruction. Fault for this resides with the LMDC for failing to properly handle the deconstruction of the former Deutsche Bank building and the companies that were tasked with the deconstruction and did so in a negligent manner (resulting in a devastating fire on the site that killed two firefighters). Meanwhile, it took until August 2010 for a deal to be struck on financing 3WTC and 4WTC between Larry Silverstein and the Port Authority. That's come at the expense of 2WTC, which has been shelved indefinitely because there's a lack of financing available for reconstruction. I think that's a terribly shortsighted mistake, and it means that construction in and around Ground Zero will persist for decades to come.Worries that followed the 9/11 attack that the era of skyscrapers in the US were over turned out to be greatly overblown, and a whole host of new towers has risen throughout New York City. Reaching skyward is what New Yorkers do, and the construction on the Freedom Tower is a reminder not only of what was lost, but of rebirth and inspiration. In time, I think people will come to like the design, even as many people still wish that the Port Authority rebuilt the Twin Towers only bigger and better. The business climate and the financial market meltdown has meant that demand for office space has declined, but it will eventually come back, and Class A space will be in high demand at some point. In other words, top quality office space is always in demand, and at favorable rates, it will draw businesses to consider working in Lower Manhattan. Turning Ground Zero into a perpetual work zone is a guarantee that those businesses wont come, because they wont want the hassle of working in such an environment. Despite this, there are significant signs that businesses are looking to the Freedom Tower for consolidating their business operations from elsewhere in the City. In fact, it appears that the Freedom Tower is one of the hottest properties in the City. Conde Nast is working out a deal to obtain 1 million square feet of space in the Freedom Tower and there is word that Bank of America or Bank of New York might take another 1 million square feet. That's on top of a deal signed by Vanatone for 400,000 square feet, which would leave just under 200,000 square feet of space that isn't accounted for. Obviously, this not a good time to be building a new 2.6-million-square-foot office tower, but with almost every construction contract already awarded or out to bid on 1 World Trade Center, and with much of the material for the building fabricated or on order, it may simply be too late to stop. Had we listened to the New York Times, not only would the site be barren of the office towers that will go towards restoring the skyline and would have perpetuated a continual construction zone in Lower Manhattan, but it would be missing out on businesses that are clamoring for Class A space in Manhattan. While the resumption of business at Ground Zero would be a memorial of sorts to what was lost on 9/11, memorial tributes continue to be built around the country, many of which are incorporating materials recovered from Ground Zero. That includes Fair Lawn, which received a piece of steel from the North Tower that will be the centerpiece of a memorial outside the heavy rescue center. Members of the unit went to New York City to assist in the rescue efforts, and were later sent to New Jersey to provide assistance to those residents attempting to return home in New Jersey. A 9/11 memorial in Bayonne, New Jersey may have to be moved because the Port Authority, which owns the site, is trying to sell it to build a container port. That has residents upset and demanding that the memorial be permanently located there. There are memorials all around the nation, yet none is more powerful than the absence of the Twin Towers and the tribute of light that shines from near ground Zero in a silent testimony to those murdered on 9/11. Former First Lady Laura Bush and current First Lady Michelle Obama will be in Shanksville, PA, at the site of the future Flight 93 National Memorial, which will open in time for the 10th anniversary of the attacks. President Obama will be attending a memorial at the Pentagon while Vice President Biden will be at Ground Zero in Lower Manhattan. The Times discusses the ad hoc memorials that sprang up around the city in the days and weeks following the attacks. However, the article itself doesn't mention who did the attacks. There is a passing reference to terrorism, but how are people supposed to remember the day if they don't remember who did this to us? It would be like remembering Pearl Harbor day on December 7 and not saying that it was Japanese fighters that launched the attack, which brought the US into World War II. Yet, there are still a significant portion of the US population (and global population) who think that the US government was either behind the attacks, or knew of the attacks and did nothing to stop them - the Troofer movement remains alive and well. Indeed, the troofers are going to be holding a multi-day conference in New York City in conjunction with the anniversary (HT: Charles at LGF). These assclowns have every right to display their idiocy, and I have every right to point out their asshattery. Just as bad is the view across the Islamic world, where many simultaneously believe that someone else besides Muslims were behind the attacks (Jews/Israel among the top choices), and cheer that al Qaeda carried out the attacks, despite all the evidence and the fact that al Qaeda has repeatedly taken credit for the heinous attacks.